Welcome to "The View From Raven Rock," my photo blog of screenshots from the beautiful and frightening and frighteningly beautiful (and even beautifully frightening) world of PC gaming. A few things inspired me to start this blog. 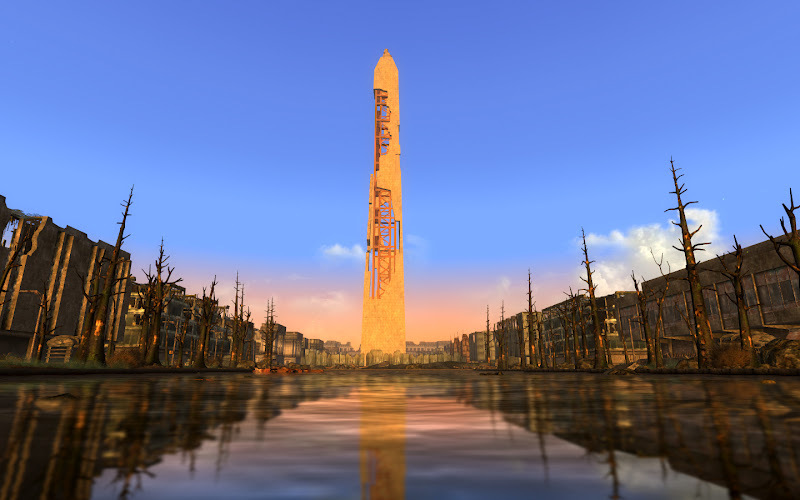 First and foremost is the recurring experience of awe and inspiration I felt while traveling the world of the Capitol Wasteland in Bethesda's fantastic post-apocalyptic ARPG (Action Role-Playing Game), Fallout 3. There were so many striking locations and beautiful vistas among the destruction and rubble of 23rd Century Washington DC. This experience was further amplified by the wonderful world of mods, especially NMCs Hi-Res Texture Pack and Marcurios' excellent URWL (Ultra Realistic World Lighting) mod, as well as a few others. Secondly, I was disappointed at the lack of great-looking screenshots from Fallout 3 on the internet that I could use as a desktop backgrounds. Third, I was inspired by the work of the man behind the Dead End Thrills blog (Link) and his beautiful screenshots that accomplished exactly what I was looking for...except for when it comes to Fallout. So I decided that it was up to me. After taking a number of screenshots of my modded version of Fallout 3 to use for my own computer and feeling quite satisfied with the result, I have finally decided to post them online for anyone else interested in some truly striking virtual postcards of the unforgettable world of Fallout 3 (and eventually, Fallout: New Vegas). So please download, enjoy, and pass the word along. *Unfortunately, my screenshots at this point are only 1440 x 900 (my monitor's native resolution) so they aren't true HD (let alone anything higher). This is a limitation I hope to overcome soon, but as the old saying goes, "I'd rather see a crooked furrow than a field unplowed." In other words, I'd rather provide my fellow Fallout fans with a 1440 x 900 image than not post anything until I get a full HD monitor which may not be for a long time. Take them for what they are and I hope you enjoy the beauty and fear of Fallout 3!